The operating system hides certain files and folders by default, to reduce clutter and to prevent users who don't know what they're doing from accidentally damaging their system. On Windows, Linux, and Mac OS X 10.7 or above, the profile for your Mozilla application is stored in a hidden location and, to find it, you will need to show hidden files and folders. You may also need to find other hidden files and folders. How you do that depends on your operating system. 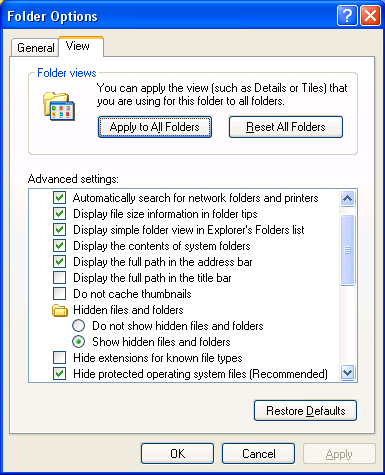 In Folder Options, click the "View" tab and, under "Hidden files and folders", select "Show hidden files and folders" ("Show hidden files, folders, and drives" on Windows 7). You might also want to uncheck the "Hide extensions for known file types" box, so that you can see the file extensions for all files. If you still can't see the hidden files, you may need to uncheck the "Hide protected operating system files (Recommended)" box. This should only be needed in rare cases, such as showing certain system files. Make sure you recheck this box after completing your task. This article includes detailed instructions for viewing hidden files and folders on Windows versions up through Windows 8. Windows includes a built-in search tool that can be used to search for files and folders. If you are using Windows 2000, the instructions above will also enable searching hidden files and folders. If you are using Windows XP or Vista you must enable searching for hidden files and folders in the search tool itself. Windows XP: Click "Start → Search". In the Search Results window, scroll down and click "More advanced options". Check the boxes, "Search system folders", "Search hidden files and folders" and "Search subfolders", as shown above. Windows Vista: (Previous to SP1) From the Windows Start menu, click "Search". In the "Advanced Search" area, select "Include non-indexed, hidden, and system files (might be slow)"  In Windows Vista SP1 or later, follow the instructions below for Windows 7, which should be similar. Linux hides files or folders that begin with a dot. Most file managers (Nautilus , Konqueror, Thunar) have a "View -> Show Hidden Files" command that will make them visible. If it doesn't have that exact command it should have something similar. For example the Dolphin file manager doesn't have that command because it lets you enable showing hidden files by modifying the folders view properties. If you enable "show hidden files" in the file manager when Mozilla calls the native file picker it will also show hidden files. You can also right click on the directory listing in the file picker (such as the Attach files(s) window) and select "Show Hidden Files"... if the option exists. For other solutions, see this 2014 osxdaily article and this 2018 macworld article. Mac OS X 10.6 Snow Leopard and below: The profile folder for your Mozilla application is not hidden but you may need to find other hidden files or folders (see below). Start the filename with a period. Use file metadata to set the invisibility flag. Normally you're only concerned about files or folders that begin with a dot. You can make them visible by typing the following in a terminal window. Open a folder called Utilities. Start the Terminal application by double clicking it. When you open the Terminal it will show a one line greeting, and a terminal prompt on the second line. The terminal prompt shows the name of your computer plus the current directory. The Terminal provides a command line interface to the UNIX shell, which is just another way to work with your Mac. Rather than clicking on folders, icons or selecting commands from a menu with a mouse you type text commands. You exit the Terminal like any other application. Click here for a tutorial on how to use the Terminal .